Non-indigenous elements and influences of fauna and flora can be found in many different aspects of Egyptian society, including art, architecture, and ideology. One can think of the famous botanical garden of Thutmoses III, the many expedition reports of the Amarna archive and the numerous depictions of tribute and offering scenes at tomb and temple walls. However, a detailed cultural and chronological investigation of non-indigenous elements in texts, images and other material legacy, in which the various functions and meanings are considered and compared, is still lacking. The aim of the dissertation project is to present an extensive and detailed study, with a focus on the non-indigenous fauna and its changing or even constant elements. With the help of diachronic approaches, the archaeological, iconographic and written sources will be investigated in a comparative analysis. Therefore, the dissertation project will not only include the concepts of the non-indigenous fauna in ancient Egypt, but also the function and meaning of these animals in their native environment. Additionally, the question will be explored whether a change in function and significance of the animals has occurred since their first appearance in Egypt. 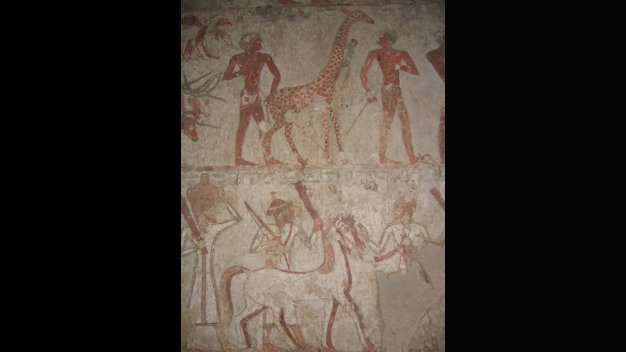 Although the temporal focus of the investigation will be the Pharaonic era, even predynastic sources will be considered as a variety of non-indigenous animals (e.g. goats and sheep) has already been adopted in Egypt in the Neolithic period. Former non-indigenous animals may have acquired an indigenous character / status. First, a list of indigenous and non-indigenous animals in Egypt will be developed. It should be noted that the spectrum of non-indigenous animals was continuously subject to change. Thereafter, the function and importance of the individual animals will be discussed and compared. In order to shed light on concepts of non- indigenous fauna in ancient Egypt, the central questions will be whether the handling of indigenous and non-indigenous animals differed and whether these animals have been attributed in comparison to their country of origin equal or different meanings and functions. Moreover, a diachronic and interdisciplinary approach will determine differences and similarities between periods, regions, and cultures and will show which aspects have been copied and transferred or which stayed even unique. The dissertation project was completed in December 2017.